Looking for a simple introduction to finite element analysis? 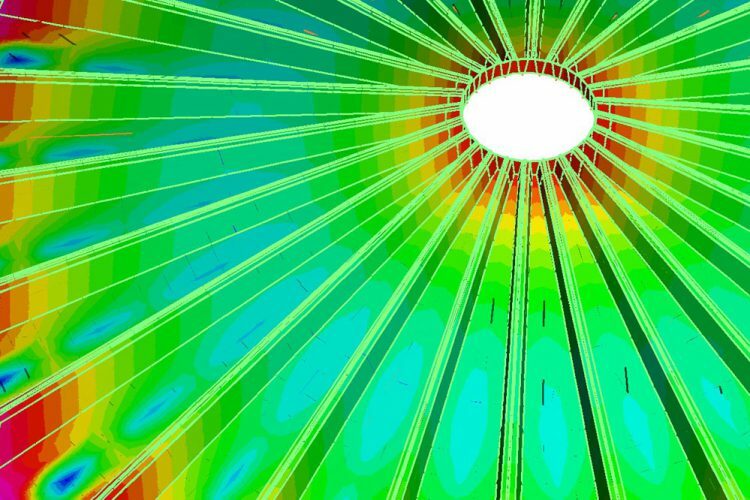 Check out our explainer, What is Finite Element Analysis? It can be seen in this that the results are dependent on the previous (multiple) complicated steps. Finite element models produce many measures for different results; almost always there are more than is relevant. Correctly computing the variables is the priority, and after this the best way to display them can be chosen. Ultimately all FE models are susceptible to the ‘garbage in, garbage out’ principle: a model will provide misleading results if created incorrectly. All models should be carefully planned, executed, and challenged to ensure they give realistic results. Before the modelling can even start, it is important for the engineer to sit down and plan out the problem as fully as possible. This would typically include creation of the geometry, planning of the loading scenarios, the fixings of the structure, and the materials that might be used to construct the part. At the same time, the potential manufacturing process should be considered for its effect on the structure’s shape and material properties. The approach to geometry creation can depend on the software available. Complex forms are frequently created in a separate computer aided design (CAD) program, although some FE applications allow for direct creation of forms within the work space. This latter kind of native modelling is usually very labour-intensive, and reserved for simple forms such as boxes, cylinders, beams, and simple test samples. Depending on the software, nodes can sometimes be imported as a list of coordinates that the software then interprets. The mesh is constructed of nodes (coordinate locations within the modelling space) connected together using elements (that define the material properties locally and how displacements are approximated within the element). If using a CAD program to create the geometry, a series of surfaces and solids may be created, in the form of a STEP, STL, or IGES file (although other file extensions may be used, these are the most common). The CAD file can be directly imported into the FE software to be assigned a mesh automatically (called automeshing). Alternatively, CAD files can be imported into a dedicated mesh generation software. Both of these options allow for the creation of regular, locally refined meshes that will then be used in the analysis. 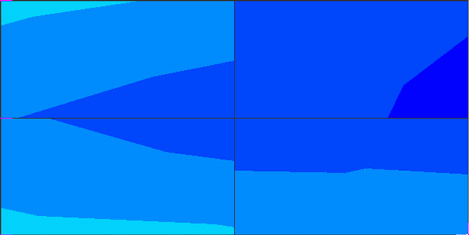 over the region of load application or incident heat flux (such as a mass resting on a surface). The type of element used will depend on the complexity of results that are required, the structure being modelled, and the availability of computing power. The largest commercial FEA software packages can have more than 100 element types, but the most common are as follows. For most modelling cases, the most accurate and efficient models have fine, linear, undistorted elements with flat sides. These usually give better results for less computational expense than a comparatively coarse quadratic mesh. Where curved surfaces need to be modelled, this can be done with a fine mesh of flat sided elements, or with quadratic elements. When using quadratic elements, care must be taken to keep the curve of the element quite shallow to keep the accuracy of results; for example, 3D quadratic shell elements should not be used on curves greater than 15°. Given that linear elements yield reasonable results if it is suitably fine, what is the justification for using any other type of element? Linear elements can suffer from shear locking, which is an issue in modelling thin beams in bending where the mesh is either too coarse or severely distorted. In a thin beam model the bending mode of the beam is much greater than the shear mode and the mesh greatly overpredicts the stiffness of the beam, causing it to underpredict the maximum displacement. 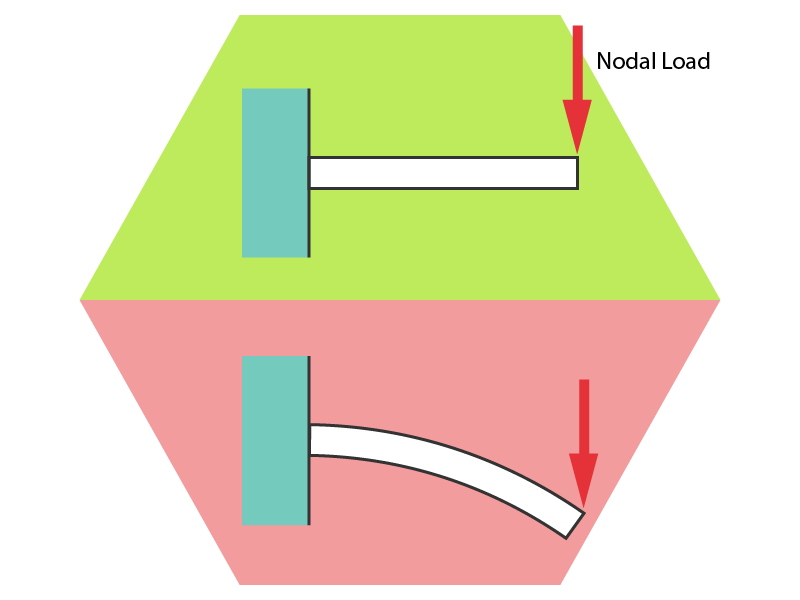 Shear locking can be avoided using higher order elements with midside nodes or, if available in the software, using linear elements that are designed to avoid this. In ANSYS, for example, linear mesh types such as BEAM188, or the PLANE182 mesh under certain conditions can prevent these issues. In an area of special interest (e.g. around a hole, or a crack tip) the mesh can be locally refined to give the same results in this area as for a globally applied fine mesh. However, triangular 2D linear elements and tetrahedral elements should not be used in regions of particular interest to the engineer, or where results are likely to change significantly within the local area. This is because the results change linearly within the element and the resulting shear locking effect can influence the results. Linear 2D quadrilateral and 3D brick elements also suffer from shear locking but the shape functions (the formulae used to interpolate results within an element, between nodes) help to reduce this. It is preferable to refine the mesh or use higher order elements (or both) within areas with large changes in results. The mesh is an integral part of the model and it must be controlled carefully to give the best results. Generally the higher the number of elements in a mesh, the more accurate the solution of the discretised problem. However, there is a value at which the results converge and further mesh refinement does not increase accuracy. 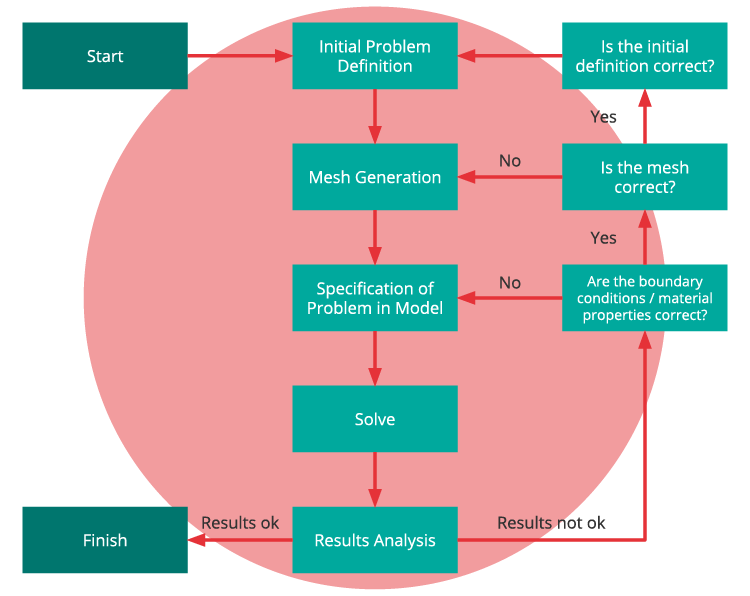 Meshes that are too coarse risk large errors in results, and can capture stress concentrations poorly. Meshes that are too fine require large amounts of time and computing power, and this level of detail is generally unnecessary. As mesh density increases, assuming there are no singularities or other errors in the model, the results will tend to a finite value which is the correct result for that particular model. However, it is always important to remember that a fine mesh density does not necessarily give correct results, even when the results converge. Whether this converged value is representative of the stresses in the ‘real life’ part will depend on the quality of the model and other preprocessing stages. Figure 2 shows the effect of mesh density and element type on the results of a finite element model of a simple beam, loaded uniformly across the top edge and fixed at both bottom corners. 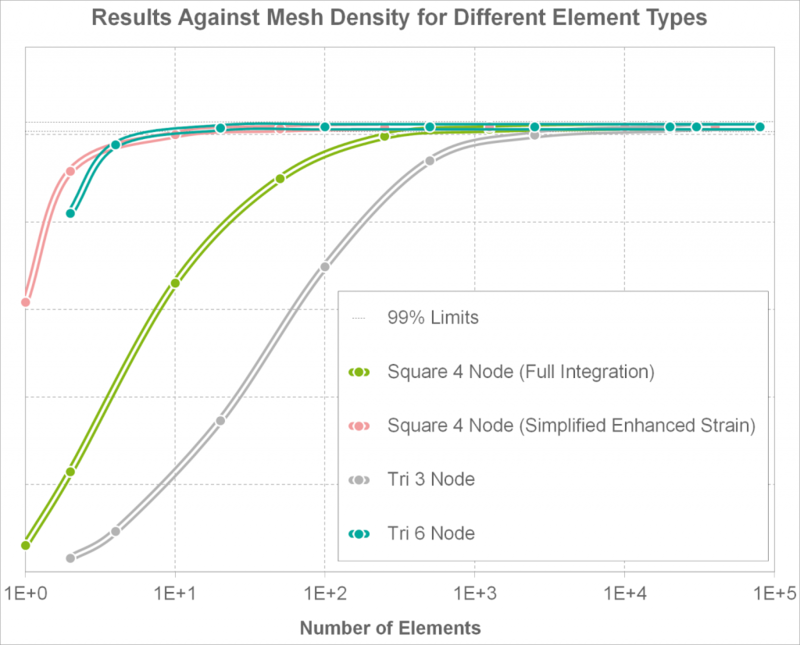 It is clear that Tri 3 Node mesh takes the longest to converge to within 99% of the converged value, and the Square 4 Node mesh similarly requires a large amount of elements to get an accurate result for even a simple model. This demonstrates the effects of shear locking within the elements reducing the accuracy of the results. 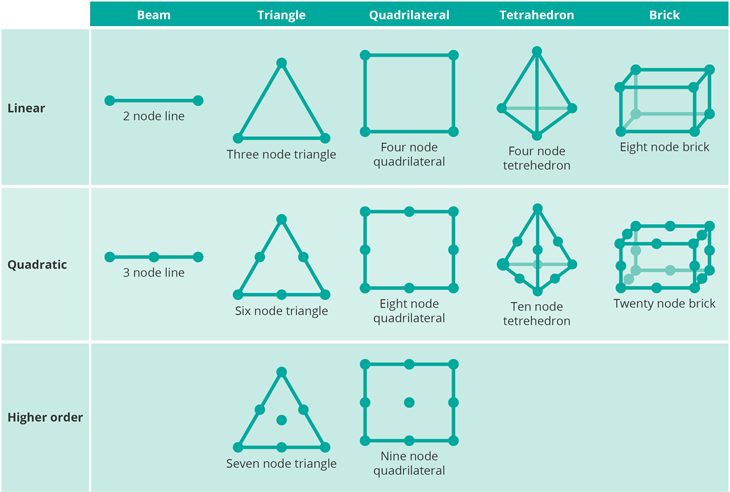 Higher order elements, such as the Tri 6 Node mesh, are much more accurate even when there are few elements. There are also low order elements created by analysis software to try to combat this issue. The Square 4 Node (Simplified Enhanced Strain) element created for ANSYS software is a linear element but with much greater accuracy at low numbers of elements. To get a reasonably continuous result contour (e.g. of stress variation across the model), the model must either be of sufficiently high mesh density, or the “average” property across boundaries can be shown. This is another assumption, and should be monitored carefully for accuracy. 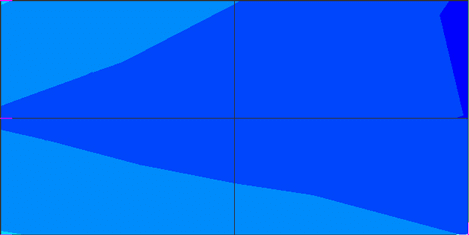 Figure 2 shows a bending model, with no averaging of the stress across the element boundaries. Due to the symmetry of the problem, only one half of the model needs to be modelled, with the line of symmetry at the left hand edge (there is more information about simplifying models using symmetry later on). It is clear that while the mesh is coarse, the property can change significantly across an element boundary. As the mesh density increases, these jumps smooth out until the visualisation of the averaged results and the non-averaged results are approximately the same. Generally a high mesh density is as required to provide good results. However, big models take a long time to solve (taking hours or even days for especially detailed models) and this has a big effect on the cost of analysis. One way to reduce the modelling time, and therefore cost, is to reduce the model to two dimensions, or to consider the symmetry and expected motion in the model. Simplification of the model in this way is only possible if both the geometry and loading conditions have the same symmetry. It is also not relevant to dynamic or buckling analysis, as the restraints can hide higher order responses. The four most common types of symmetry are axial, planar, cyclic and repetitive. The bending model shown in Figure 1 is simplified using planar symmetry. The loading is symmetrical about the centre vertical axis, but not symmetrical in any other plane so this is the simplest model possible. 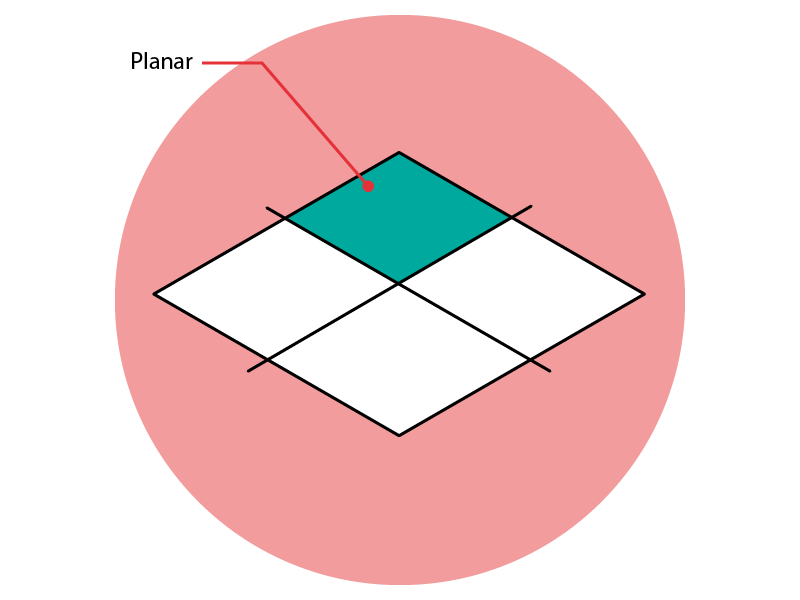 Planar symmetry applies where the model geometry and loading is symmetric about the centre line in Cartesian coordinates. 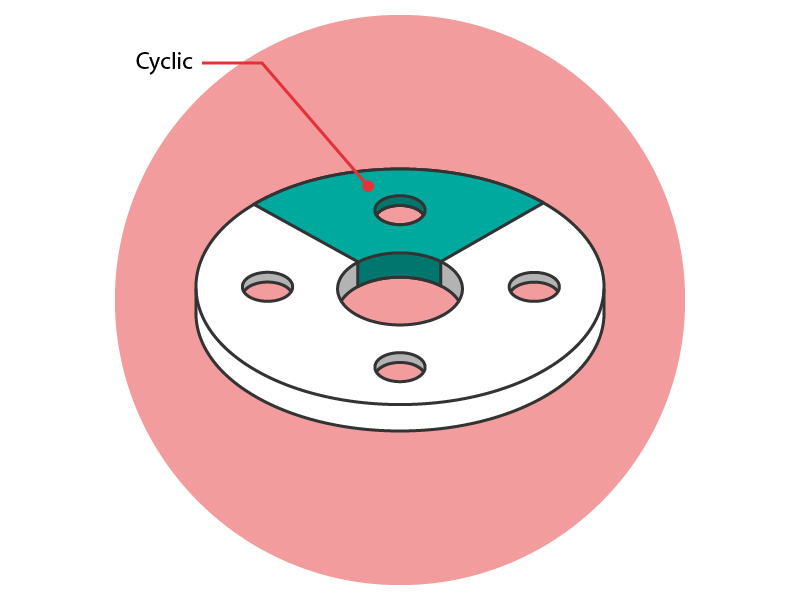 For example, a simple open hole model in tensile loading will not displace at the centre, where the loads are balanced, and also will not displace along the length of the sample at the centre. The displacement in the out-of-plane direction can be neglected. Therefore only a quarter of the sample needs to be modelled, with the correct constraints applied to all nodes on the lines of symmetry. However, our previous bending scenario shown in Figure 1 is only mirrored about the centre axis between the supports. 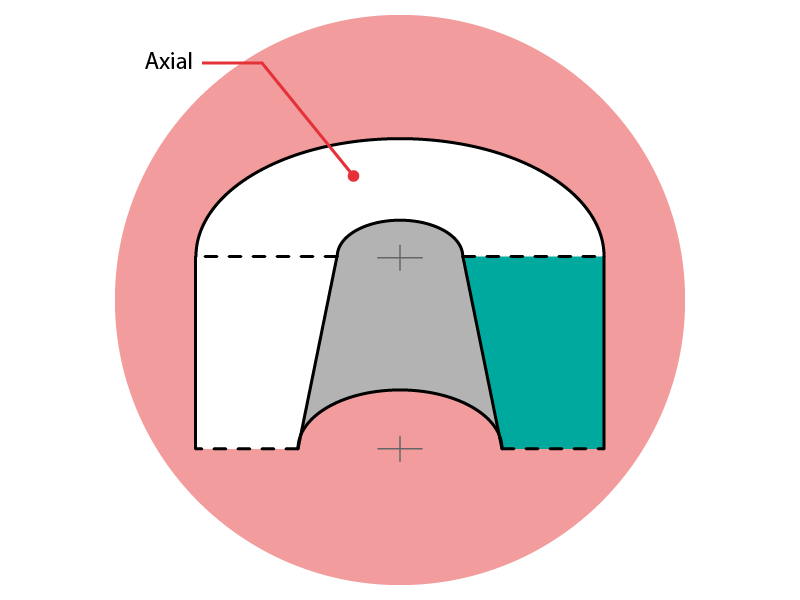 Axial symmetry assumes that the distribution of variables around a circumference is constant, and therefore only a section of the wall through-thickness requires modelling. Examples of this are conical roofs, or axisymmetric water tanks. Cyclic symmetry is similar to planar symmetry but described in cylindrical coordinates, such as a wind turbine fan. 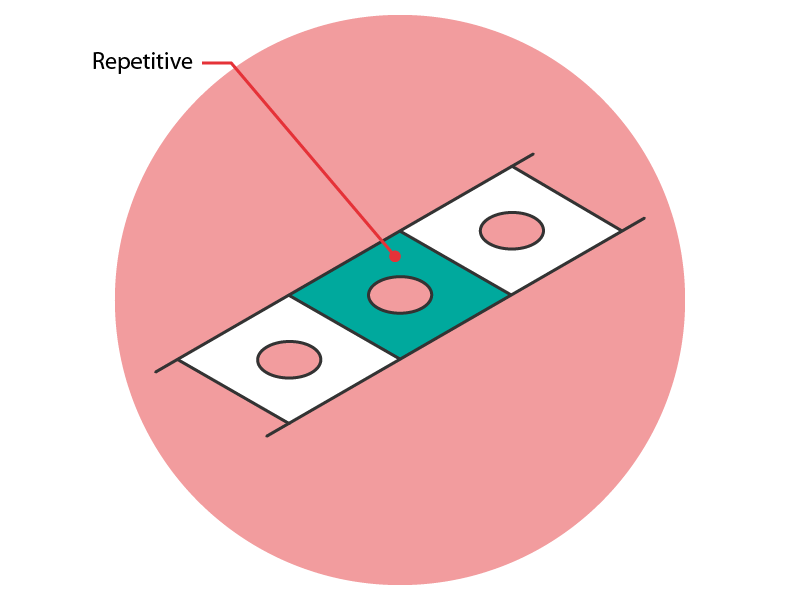 Repetitive symmetry involves repeated sections of a model restrained perpendicularly (imagine a section of a cylindrical pressure vessel with evenly spaced rib reinforcement mounted to the ground) is the least common of all the types of symmetry as the structure must be sufficiently long to avoid the end sections having an effect on the model. Material properties are another requirement of the model. Many FE applications will offer a materials database library which gives reasonable properties, although these may need to be compared with both experience and relevant standards for accuracy. Some industries have simpler requirements than others in this regard; metals and metallic materials are largely isotropic (having uniform properties in all directions) and have decades of test data underpinning the materials libraries for the most common alloys. Although metals have the data to back up the models, composites are still very attractive to engineers because they are beneficial in many applications. They have high specific strength and stiffness, and are lower density than structural metals. They also have other more specialised benefits, such as being transparent to radar , fire-resistant, or even just aesthetically pleasing. However, modelling composites accurately is more difficult than modelling isotropic materials. The modelling difficulties can depend on the concept but might include any of the following. Anisotropic material properties (different properties depending on the direction). some materials are not compatible with certain manufacturing processes. The effect of fatigue on the structure, as all composite materials can react differently. The interface between composites and other materials, especially at bolted connections. How to model the fibres and matrix interaction. Simplification (or not) of local reinforcement or sandwich structures with a core. Whether the material is going to behave linearly or non-linearly within the loading scenario. Avoiding the temptation to go for simpler ‘black metal’ models, where a metal structure design is replaced like-for-like with composite material. Black metal designs are rarely advisable: performance composites are usually more expensive than metals, and it is almost always worth taking the time to tailor the structure in the model to take advantage of the composites. For some composite materials (such as glass fibre, commonly used in the construction industry) there are standards such as EN13121 (GRP tanks and vessels for use above ground) which state standard properties of different types of glass fibre and matrix materials. A boundary condition is a user-defined, known constraint or load applied to the model. The software uses these to solve the set of differential equations that underpin the finite element analysis. For restraints, known as Dirichlet boundary conditions, depending on the type of analysis, the displacement, rotation, or heat flux at certain points in the model is restricted. This value can either be restricted to zero (homogeneous boundary conditions) or to a fixed value (non-homogeneous boundary conditions). This is the step which fully relies on the engineer’s experience and judgement. An under-restrained model may present higher deflections, and an over-restrained model may show high stresses at unrealistic points. Knowing where to apply loads can also be tricky, especially where a large variety of load cases are possible. Load boundary conditions are known as Neuman boundary conditions. Common loading types and examples are shown below. The effect of the forces on the structure should be considered also when assigning loads. Large resulting displacements cause issues as these may change how forces interact with the model. 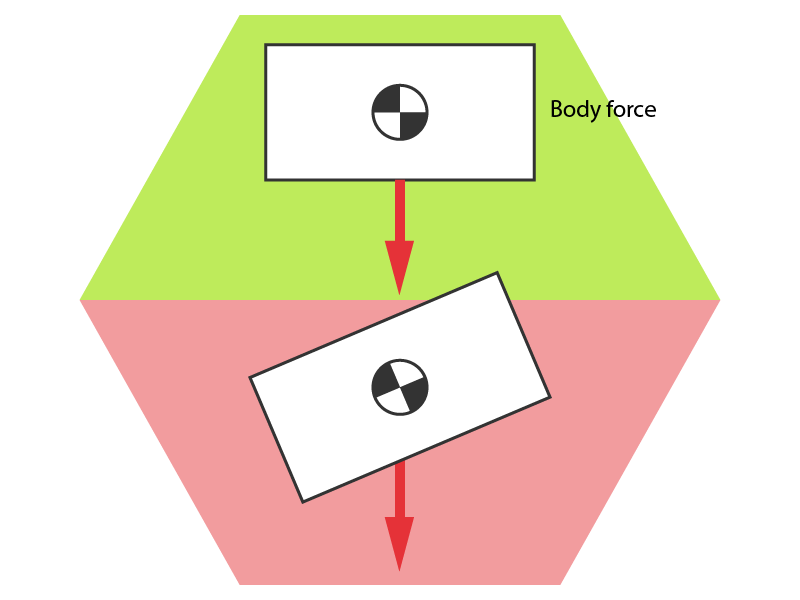 Nodal forces and body forces (e.g. an external mass and self-weight) are likely to retain their global directions. 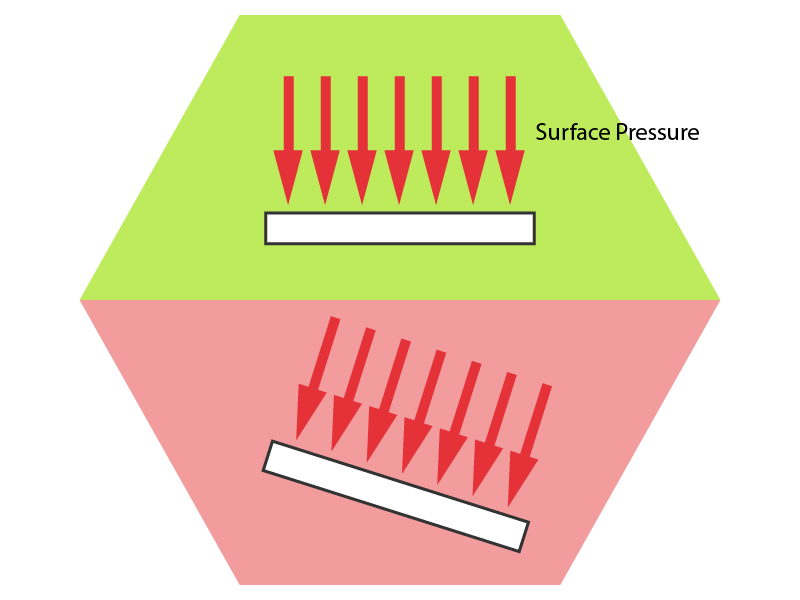 Surface forces, such as air pressure, will follow a surface as it deforms, changing the direction of the force. For many applications, linear solutions with higher order elements and fine meshes are appropriate to produce correct results. Computationally these are more efficient than nonlinear solutions which can take days to solve. However, linear analysis is no longer appropriate when a scenario involves either material, geometric, or constraints/contact nonlinearities. Materials loaded in the elastic regime behave linearly: doubling the applied force, for example, will double the resulting displacement. Once the force is removed, the material returns to its unloaded state. However, if a material is loaded above the elastic regime (or worse, does not exhibit any elastic behaviour) then the material deformations are permanent (plastic behaviour). In these cases, the results must be calculated incrementally and the calculated displacements are a function of the displacements from the previous step. In a linear analysis we can assume that the elements do not displace by large amounts, and therefore that they maintain their shape. In nonlinear analysis, this is not necessarily true. Resolve the conflict by calculating appropriate loads on the relevant nodes. Clearly a nonlinear analysis model swiftly becomes a huge computational effort to solve. It is up to the engineer to decide whether full nonlinear analysis is required, or if a carefully modelled linear analysis could provide similar results. 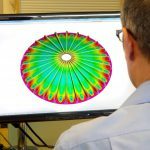 Finite Element Analysis is a powerful computational tool for structural analysis, but it is possible to make mistakes when unfamiliar with the process. In-depth knowledge of appropriate materials, mesh quality, and model specification is required to get results that are relevant. How is this FEA theory put into practice by Coventive Composites? Consider reading another Explainer on a real world application (“GRP Tank Covers: How to meet regulatory requirements in a cost-effective way”), see our list of structural modelling case studies, or get in touch to find out how we can meet your individual modelling requirements.